A Wedding Photographer for Buttermilk Falls is able to capture scenes that are set in the picturesque Hudson Valley area of New York. Buttermilk Falls Inn and Spa is a wonderful location for a lovely outdoor wedding ceremony and reception. As a Wedding Photographer for Buttermilk Falls I took this picture of the bride and groom sharing a moment alone on the grounds of the inn. In the image, the couple sit in a tranquil scene. This area of Buttermilk Inn’s estate is one of the many secluded, serene places where couples can wander off to for a few moments alone on their wedding day. The bride and groom in this photograph look completely at ease with one another and at peace in the nature that surrounds them. The newlyweds sit on a strategically placed fallen tree trunk. The large log had been cut and was moved to the edge of this pond so that guests at the Buttermilk Falls Inn and Spa could sit along the water and enjoy the breath-taking scenery that the inn’s property provides. The bride is radiant in her white wedding gown, with a bouquet that overflows with greenery and flowers of red, pink and white. 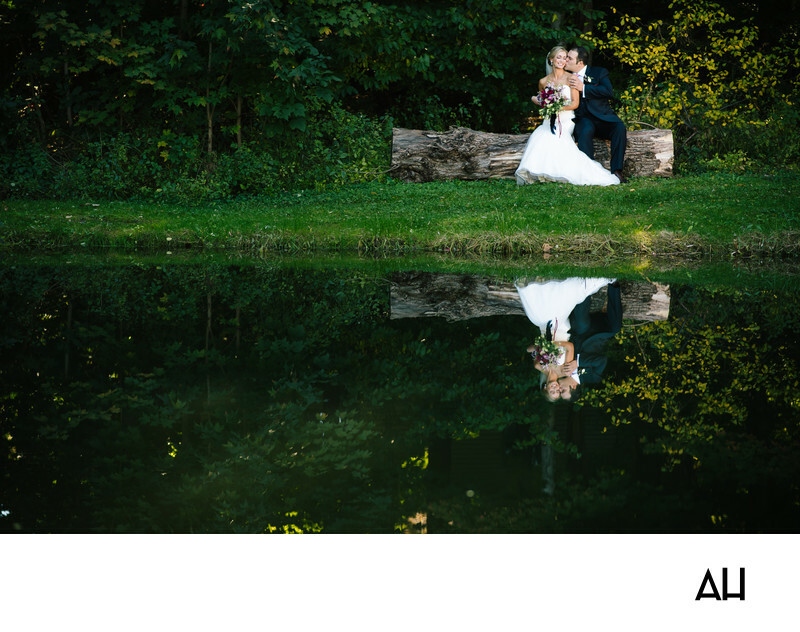 She closes her eyes in contentment and the smile that lights up her face is reflected clearly in the pond before her, a mirror image of the love that makes up the picture made by the bride and her new husband. The groom holds his bride close as he leans in to tenderly kiss her cheek. It is a moment that demonstrates the beautiful relationship shared by the newlyweds and as well as the beauty of the setting of their wedding day.